Roger Federer steam rolled past world number one Novak Djokovic 6-4, 6-4 to ensure he booked a place in the Shanghai Masters final against Gilles Simon. The Swiss man emphatically took the first set 6-4, after rallying some extraordinary tennis with Djokovic. In the final set, Djokovic showed signs of a comeback, but that was then crushed by Federer who scraped past the Serbian with a 6-4 match win in the second. However, in the first set, both men were rallying for a lengthy time of 48 minutes, which saw Federer convert a break point and go 3-2 up. Djokovic had a great chance to hit back, but the 22-time Masters champion held him off to extended his first set lead to 4-2 and then progress to 6-4. This is Djokovic's first defeat on Chinese soil since 2010, and the former champion will surely be looking to hit back and retain his number one spot next time out. The two players were on court over an hour and half, trading magnificent play which got the crowd off their feet several times. Gilles Simon will battle Federer in the highly anticipated final contested tomorrow. That match has all the ingredients to be a true classic. After displaying one of his best performances against Djokovic here - Federer will be confident going into the final against Gilles Simon. 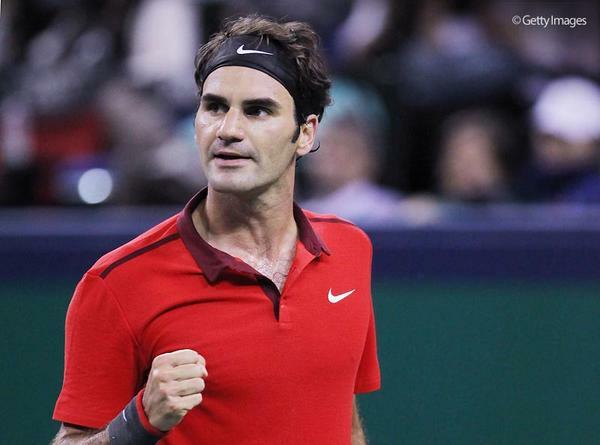 Roger Federer steam rolled past world number one Novak Djokovic 6-4, 6-4 to ensure he booked a place in the Shanghai Masters final.